The Learning Skills for Science (LSS) programme was first produced at the Weizmann Institute of Science. In 2004, the Gatsby Science Enhancement Programme (SEP) commissioned further work to enable the materials and training programme to be used in the UK. The project has achieved widespread recognition both in the UK and abroad. resources that can be integrated into a variety of scientific subjects. The project provides support for students aged 14-19. Each skill area is divided into sub-skills, for example Skill Area 5 Scientific writing covers how to prepare a report, write an article and construct an abstract. Develops information literacy relating to the specific needs of learning science. Prepares students for independent learning. Demands thoughtful engagement with resources (information input) and with audiences (information output). Provides meaningful backgrounds for learning about specific science content. Between 2008 and 2011, Gatsby together with the Nuffield Foundation enhanced the LSS materials and incorporated them into a range of publications to support a number of areas of the curriculum. 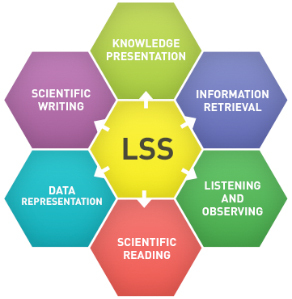 In 2008, a major development produced subject-specific LSS activities to support the Advanced level specifications in Biology, Chemistry, Physics, Applied Science and Science in Society. In 2009, activities were chosen to complement the teaching of the new Extended Project Qualification. More recently, LSS activities have been incorporated into core material which support the GCSE science specifications in Twenty First Century Science. Twenty First Century Science - Specific resources have been incorporated into materials to support teaching of the Twenty First Century Science suite of GCSEs. Further details are available from Oxford University Press. For enquires related to the Gatsby Learning Skills for Science Programme please contact us.